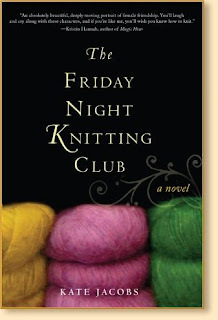 I've now finished reading, "The Friday Night Knitting Club" by Kate Jacobs and I can really recommend it. The characters and story are great! It's the only book that made me teary at the end. Now I've started reading "Back on Blosson Street". I got into reading the Debbie Macomber "Blossom Street" series when "The Shop on Blossom Street" came out in paperback about four years ago. The others in the series are, "A Good Yarn" and now "Back on Blossom Street". Her newest book "Twenty Wishes" will be out in hardcover in April, but I'm cheap, so I wait for the paperback edition. This series isn't as good as "The Friday Night Knitting Club", but it isn't bad.